The appearance of containers and their performance benefits compared to the existing paradigm of virtual machines has forced several companies to rethink their software lifecycle, especially the delivery part. Continuous integration and deployment tools (CI/CD) are passing through a second renaissance phase which is characterized by new approaches centered around short-lived environments that are launched and destroyed in a much more dynamic way. In this blog post, we will examine the capabilities of Spinnaker and contrast it with Codefresh, the continuous delivery platform for Kubernetes. Spinnaker is a multi-cloud deployment solution, originally created by Netflix and then open-sourced in 2015. Today it is actively developed by contributors from other companies such as Google and Target and in 2017 it reached version 1.0. This is probably the most important point to understand when you evaluate Spinnaker. Spinnaker handles only the cloud deployment part of the continuous delivery process. Spinnaker does not compile code, does not run any tests and in general is not a generic task runner. To accomplish these tasks it calls Jenkins behind the scenes using the official Jenkins API. Therefore a solution based on Spinnaker essentially requires a Jenkins installation as well. The image shows the typical project pipeline where a code commit creates a Docker image, that then passes unit tests and is deployed to a staging environment. Integration/acceptance tests are then executed and if everything is ok the code change is sent to production. 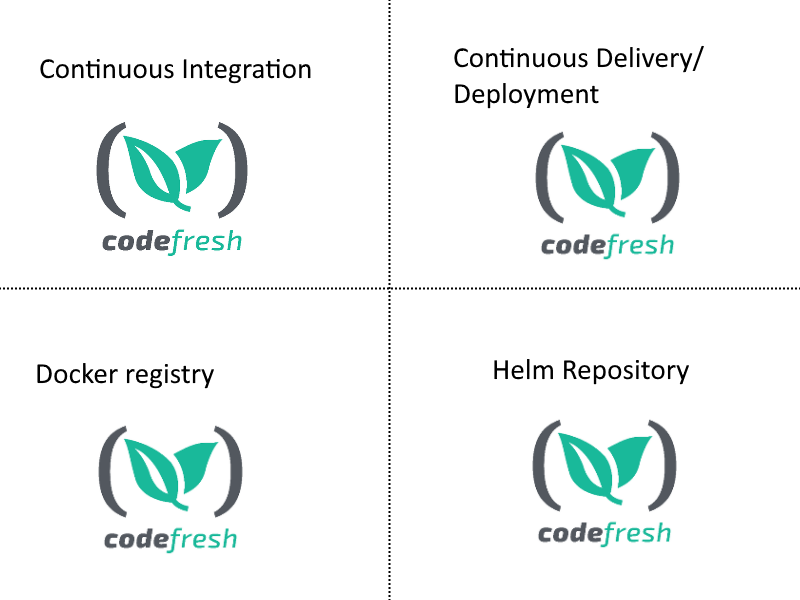 Codefresh is a single solution that implements the whole pipeline from start to finish. Spinnaker handles only the deployment parts while the actual code compilation and testing is delegated to Jenkins tasks. You should now see why Spinnaker and Codefresh cannot be directly compared. Codefresh offers a superset of what Spinnaker is offering as far as CI capabilities are concerned. The comparison is really between Spinnaker plus Jenkins, versus Codefresh. 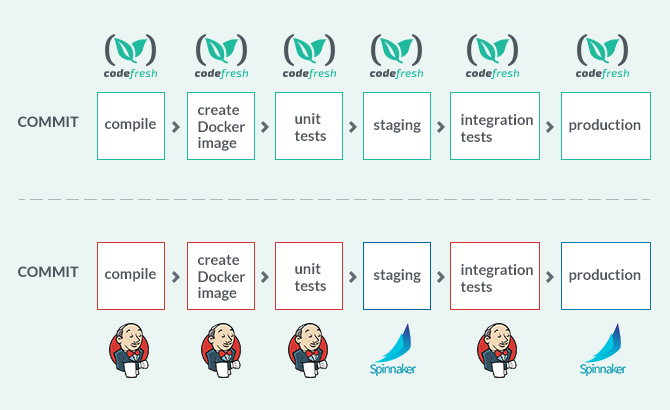 In summary, Codefresh is a complete CI/CD solution, while Spinnaker is a CD solution tool delegating CI to Jenkins. The hosted version is fully managed SAAS and is the easiest way to start using Codefresh, as your company does not need to maintain and upgrade Codefresh. This is also the perfect choice if you are a startup and want to start using CI/CD as fast as possible. Finally, Codefresh offers a hybrid solution where the management UI is in the cloud, but the work machines that compile, build and deploy code exist within the company premises. This is a very powerful option as it allows somebody to completely customize the build machines but keep the User Interface on the cloud version. The important thing regarding these installation options is the amount of flexibility when it comes to Codefresh usage. You can start with the hosted version and move to on-premises if needed. Codefresh can be easily used by a single consultant or a Fortune 500 company or anything in between. Spinnaker is only offered in a self-hosted manner. There is no SAAS version of Spinnaker. This means that any organization that wishes to use Spinnaker must invest in manpower responsible for the daily needs and maintenance of the Spinnaker installation itself. This requires an upfront investment from Spinnaker users that may not be always possible or desirable. Spinnaker itself is composed by multiple micro-services that can be upgraded individually. Installing Spinnaker is a non-trivial process given the fact that a separate application (called Halyard) was recently introduced to serve as the Spinnaker installer. In summary, Spinnaker requires in-house expertise to install and maintain right from the beginning. Codefresh offers a more gradual (and flexible approach) that doesn’t require an upfront investment. Codefresh has embraced Docker support right from its inception. All Codefresh capabilities revolve around Docker images. 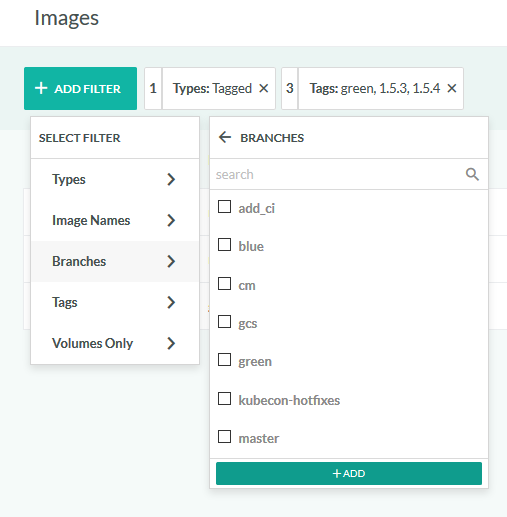 Codefresh is especially powerful when it comes to creating Docker images (Docker as a service), annotating them and storing them for later usage. Spinnaker was created with the old philosophy of creating complete VM images instead of lightweight Docker containers. The basic paradigm of creating a release in Spinnaker is merging a complete VM (e.g. an AMI) with an application in rpm or deb format (a process called “baking” in Spinnaker parlance). That being said, Spinnaker can work with Docker images as well. This functionality was later retrofitted into Spinnaker and it is not as flexible as what Codefresh offers. As a starting step, Codefresh offers a built-in Docker registry in the basic service. This Docker registry stores all Docker images produced by Docker builds for later reference. You can then use these images from that registry or promote them in an external one (e.g. Dockerhub) if you desire. But this is completely optional, you can do application deployments from the built-in registry just as well. and even search for them with various criteria. Spinnaker has no built-in Docker registry, so a Spinnaker solution would need an external Docker registry in order to fully function (we have already seen that Spinnaker requires Jenkins, so you might start seeing a pattern here on what Codefresh offers in a single service). Also, the fact that Codefresh has dedicated Docker support right from the beginning is evident from all the tools that it offers. Here are some examples. 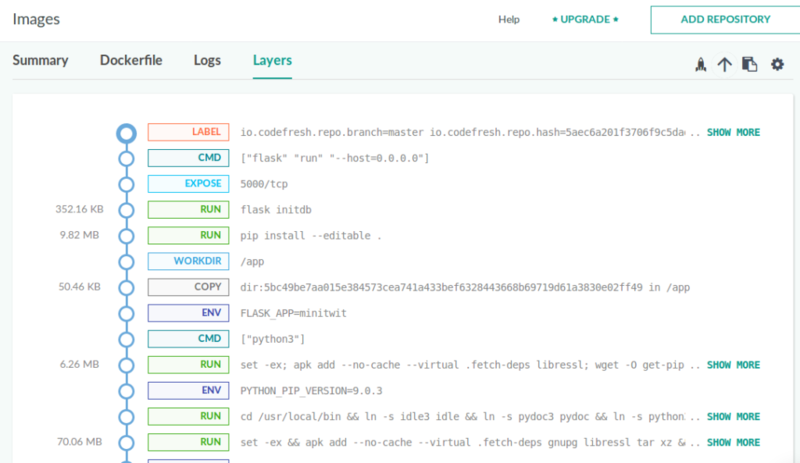 The picture above shows the analysis of Docker layers for a container that Codefresh offers. This allows you to inspect the sizes of Docker images and fine-tune the order of the steps found in a Dockerfile. 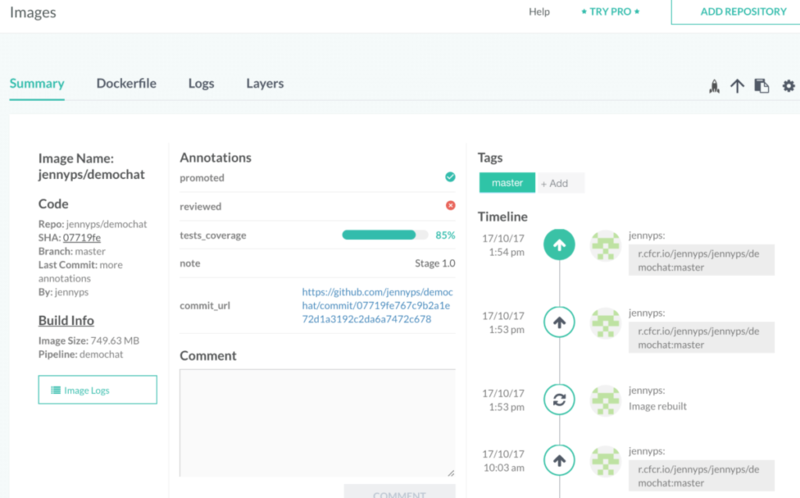 The picture above shows the annotation support of Codefresh. You can assign custom tags to Docker images in a manual or automatic way. For example, you could mark docker images that have passed integration tests or are compliant with security scanning tools. In summary, Codefresh has superior and explicit support for Docker images. Spinnaker has only basic Docker support in the form of deploying Docker images but offers nothing additional for managing them. 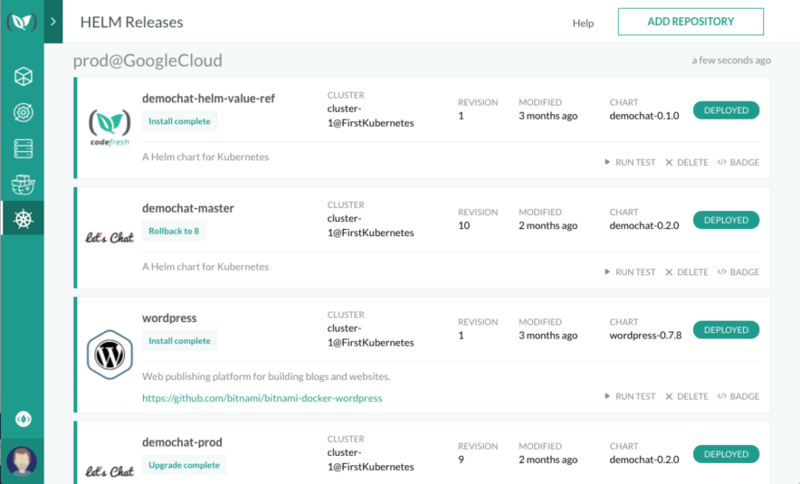 In a similar manner to Docker, Codefresh comes with dedicated support for Kubernetes deployments. Codefresh offers an explicit Kubernetes deployment step that can be used in a pipeline to deploy a docker image to any Kubernetes cluster regardless of its underlying implementation (Google, Azure etc). 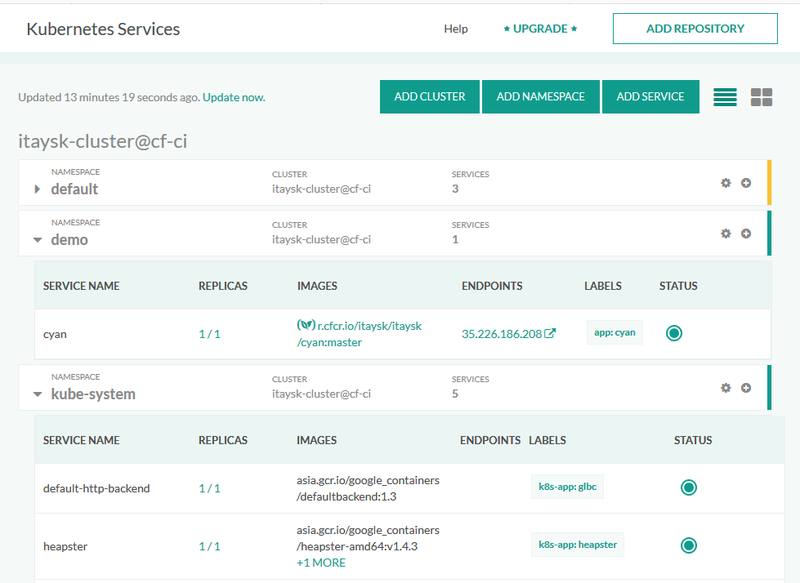 Codefresh also offers a graphical way to manage a Kubernetes cluster with everything that you would expect, such as support for namespaces. With Spinnaker, things are not so straight-forward. First of all, the “Kubernetes support” in Spinnaker is not yet stable. At the time of writing, there are actually two implementations. Version 1 of the Spinnaker provider was treating a Kubernetes cluster as another “cloud”. This resulted in a consistent experience for teams that were deploying both VMs and Docker containers via Spinnaker, but on the other hand, could not support the special characteristics that K8s clusters have. This Spinnaker provider is now marked as “Legacy”. Version 2 of the Spinnaker provider is now underway and at the time of writing it is in beta stage. This provider treats Kubernetes manifests as artifacts and deploys them on a K8s cluster as any other artifact. In the end, however, both providers are limited by the fact that Spinnaker is a generic multi-cloud deployment tool and Kubernetes support was “shoehorned” in as Kubernetes is quickly becoming the de-facto clustering solution. Codefresh, on the other hand, was designed with explicit Kubernetes support, free from the old way of deploying VMs, so it is easier to exploit specific Kubernetes features both during build time and during runtime. Helm is another area where Codefresh support really shines. Like Kubernetes and Docker, Codefresh has explicit support for Helm repos and deployments. You can see the Helm releases from within the Codefresh UI as well as browse the available Helm Charts. The Helm UI is so powerful that you can use it to easily rollback to previous versions of an application. Again this is possible because Codefresh is fully aware about the connection between application, builds, docker images and helm releases. Recently Codefresh also started offering an integrated Helm repository with each account. 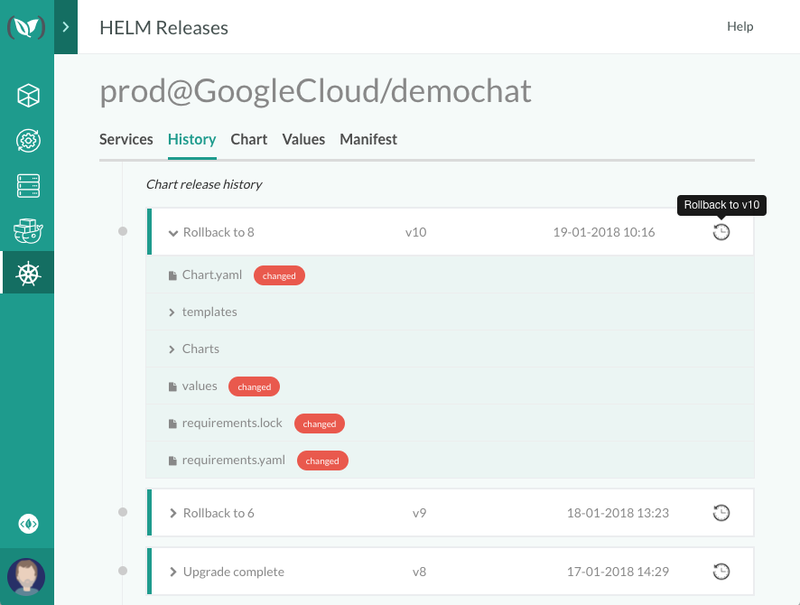 This Helm repository is offered for free and like the integrated Docker registry can help your team quickly get up to speed with Helm using Codefresh as an all-in-one solution. With Spinnaker on the other hand you need multiple components to achieve the same thing. Apart from Jenkins you also need to select (and probably pay) for a private Docker registry and Helm repository. In summary, Codefresh gives you everything you need to start with Kubernetes/Helm deployments. With Spinnaker you only get the basic Kubernetes deployment support and you need additional components for the full software lifecycle. By now it should be clear that if you wish to deploy to Kubernetes/Helm and get a single solution for all your CI/CD needs, Codefresh is a superior turn-key solution. That does not mean that Spinnaker is a bad choice in general. The truth is that Spinnaker has a different scope than Codefresh. 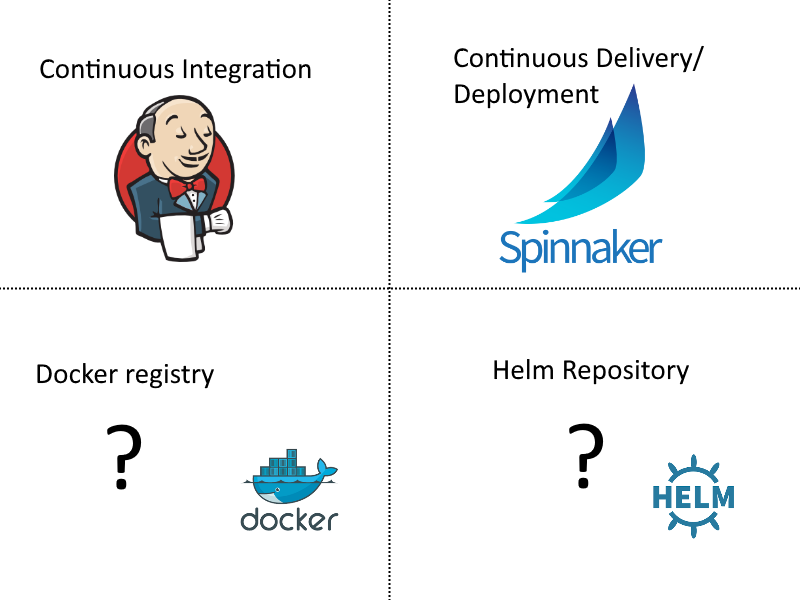 Rather then being targeted at Kubernetes/Helm, Spinnaker is a generic deployment tool that attempts to give a consistent way of deploying to multiple clouds. The big advantage of Spinnaker is that if your company is deploying VM’s to different cloud providers at the same time (e.g. Google and Azure and AWS and Openstack), you can get a common experience through the Spinnaker UI. On the other hand, because Spinnaker needs to present a common view for all cloud providers, it is hard to expose characteristics that are unique to each one (as it happens in the case of Kubernetes). Codefresh can also deploy to non-Kubernetes environments, but you would need different yml configurations for each one so some manual work is involved. Another big advantage of Spinnaker is that is has built-in release strategies such as canaries and blue/green deployments that are offered in a similar manner to all cloud providers. Codefresh also supports blue/green deployments and canaries, but of course, these are implemented for Kubernetes and would need changes for deploying VM’s to other cloud providers. Therefore if your company is not interested in Kubernetes/Helm and you still need to deploy VM’s to more than one cloud providers at the same time, Spinnaker is a very obvious contender. It is important to notice that Spinnaker and Codefresh could potentially work together. The Jenkins support found in Spinnaker is just a plugin. In theory, one could also write a similar plugin for Codefresh. This way Spinnaker could be used for CD while delegating all CI tasks to Codefresh. It is arguable whether this approach is practical or not, but it is useful to know that a team that has the resources and time to write such plugin could make both tools work together. has a dedicated management UI for your Kubernetes cluster with full view of namespaces/pods/services etc. Hope, you find this post useful. I look forward to your comments and any questions you have. To try this out, create a free Codefresh account and start building, testing and deploying Docker images faster than ever.